Discover a revolutionary new way to produce superb, chemical-free food, shrubs, lawns & flowers. Experience sensational results, whether you're a beginner or a more seasoned gardener. The Life Force® Home Garden Range involves cutting-edge formulas gleaned from decades of global experience in intensive horticulture. It is the only home garden program to provide a simple, 3-step strategy that ensures vibrant, resilient, productive plants. This is not just a "Gardening for Dummies" option – these unique formulas will improve plant performance and plant resilience for even the most experienced of home gardeners. 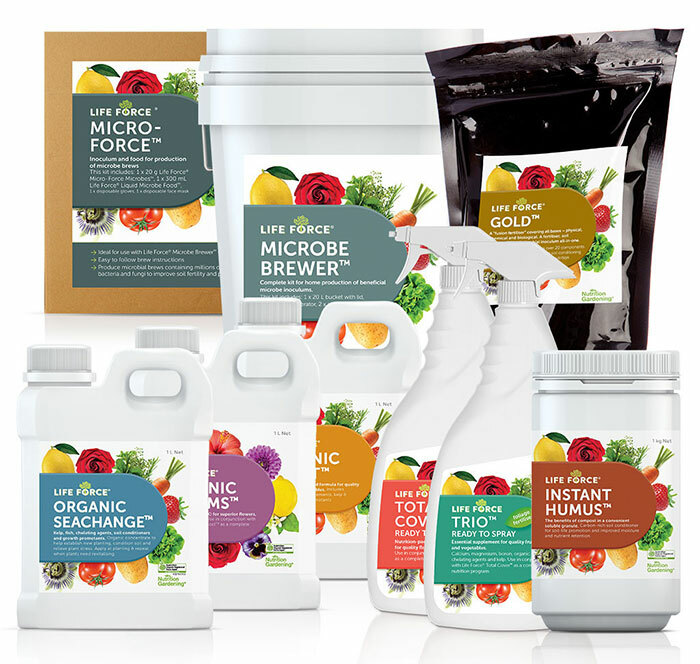 Introducing The Life Force® Box – the power of this innovative home garden range in a single, all-inclusive package. This box contains all the products you need to follow our simple and effective 3-Step Nutrition Gardening® System, bundled together at the discounted price of $139.00. Growing your own, wholesome, nutritious food has never been more important. Your home garden can be your ultimate wellness tool, offering "champagne food" at its most nutrient-dense and medicinal. The absolute luxury of picking your fresh produce directly before you eat it also translates to more intense flavours, as you have avoided the degeneration associated with lengthy food transportation. Leading chefs are finally realising that the food producer is a major factor in mastering flavour. The Life Force® Box is a perfect gift for garden-lovers, or those looking to start a fresh patch in the New Year. Please order online or call 07 5472 9900 if you wish to place an order over the phone. Please note, shipping is currently restricted to Australia only. To download your free Life Force® Gardener's Guide booklet, click here. Visit our website at nutritiongardening.com.au. Disclaimer: Prices and shipping details are in AUD, applicable at date of publication (7 December 2015).